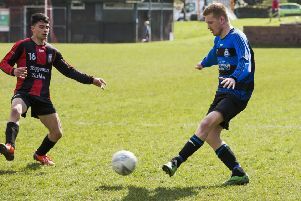 SHELF United gave last season’s runaway Division One champions Denholme United a reality check with a 6-1 win in the Haslem-Sheppard Halifax AFL’s top flight. Denholme lost only one league match in the whole of last season - to Elland Allstars in November - and had marked their return to the top flight with a promising 3-0 win at home to Copley United. However, they came unstuck big time against Shelf in a game switched from Lightcliffe Academy to another artificial pitch, at Trinity Academy. New signing Matthew Roy fired Shelf in front from the edge of the area and Luke O’Brien made amends for an earlier miss with a cross shot which doubled the lead on 15 minutes. Denholme began to find their feet and Nathan Woodhead had a penalty saved by Ethan Daly late in the first half after Danny Cook had fouled Ross Parr. Denholme looked the better side in the third quarter and Cameron Foster got them back in it on 70 minutes, only for Billy Grogan to make it 3-1 with a rebound off the keeper immediately from the restart. That deflated the visitors and Shelf ran away with the contest thanks to Sam Gee’s good finish from 20 yards, an O’Brien free-kick and Ben Burkill’s own goal with a sliced attempted clearance form the last kick of the game. Shelf boss John Lister said his side had deserved to win but admitted the final margin had flattered his side. There was a dramatic finale at Goldfields where Joseph Nicholson scored twice in the last five minutes to earn a relieved Greetland a 2-2 draw with Hebden Royd Red Star. Star had only a goal from Lewis Cockroft midway through the first half to show for their early dominance. Cockroft doubled the lead from the penalty spot after being fouled with 20 minutes left but Nicholson gave his side hope with a header from a throw-in to the near post. Then, with the last kick of the game, the Greetland player’s shot deflected off Dan Lumb and the ball crept into the corner of the net. Sowerby United gained their first win of the season with an impressive display in a 2-1 win away to Calder ‘76. The home side took an early lead when Steve Jones’s shot took a deflection to beat stand-in keeper Hayden Bruce. Sowerby were having much more of the game but Calder were proving hard to crack with George Hampshire and Keiron Sim solid at the back. Sowerby drew level two minutes into the second half when Rory Thickett raced clear and calmly slotted home. Dan Crosland had a penalty well saved by the Calder keeper but manager Garry Boyd sent on Kurtis Rennalls and the 17-year-old got the winner with his first touch. Calder had two players dismissed in the final minute for comments to the referee after having a penalty appeal turned down. Sowerby Bridge opened their account for the season after a couple of draws with a 4-1 win away to Copley United. Damo Watkins opened the scoring with a header but the teams went in level after Bridge keeper Jordan Bolton pushed a 25 yard effort in to his own net. Bridge flew out of the blocks in the second half and Sam Hiley restored the lead after great work by his brother Tom, who was excellent in midfield alongside Adam Barlow. Hiley scored again 10 minutes later with a simple finish and Martyn Bates wrapped things up with five minutes left. Midgley United are top and Ryburn United bottom of the early-season table after the game between the pair at Midgley Rec produced a 3-0 home win. Goals from Toby Standring, Tom Hosker and Jack Holmes did the trick for Craig Gee’s side against last season’s runners-up. Standring made the breakthrough after an even opening, cutting in from the right and curling the ball past the keeper. Hosker got on the end of a low cross from Dan Vile to make it 2-0 after 30 minutes. Ryburn stepped up their game after the break and had plenty of possession but Midgley held firm and Holmes’s looping shot into the top corner with 20 minutes left made the points safe.